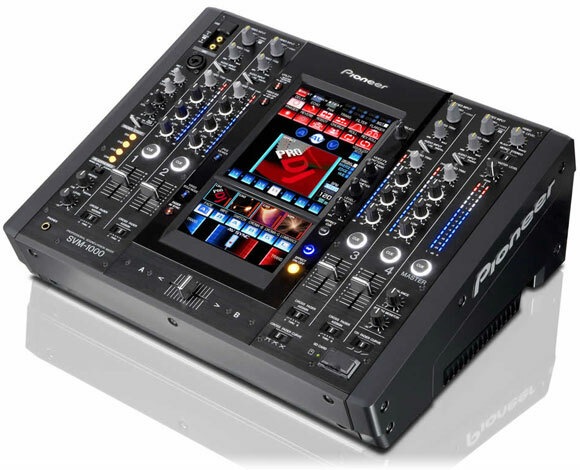 Pioneer have broken new ground in overstatement with the announcement of their upcoming Video/Audio mixer, the US$6000 SVM-1000. WorldÃ¢â‚¬â„¢s first mixer for 4-channel audio and video. I guess they completely missed the AVM02 then? I’m not sure how, it’s rather big and heavy. Big touchscreen. I hope it does useful stuff. 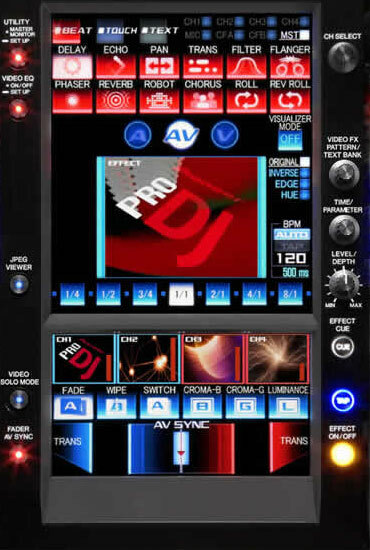 Within the SVM-1000Ã¢â‚¬â„¢s 11-inch LCD touch panel (conveniently located front centre) is an AV Effect section, which enables the synchronisation of audio effects and video effects. This function is capable of 30 patterns of effects on the audio and/or visual side, meaning that you can create countless combinations of effects. Each effect can be selected via an animated icon button for an easier (visual) understanding of the effect, thereby allowing DJs to instantly select the best effect for their performance. AV Beat Effect: Automatically detects the tempo (BPM = Beat Per Minute) of the music and affects both audio and video in time with the beat. There are 12 patterns of Beat Effects: DELAY, ECHO, PAN, TRANS, FILTER, FLANGER, PHASER, REVERB, ROBOT, CHORUS, ROLL and REV ROLL. Indeed, users are fully armed on the effects front as each effect allows access to several more effects, including INVERSE, EDGE and HUE . AV Touch Effect: Enables a more sensuous use of effects because it allows users to touch and affect the visuals directly, as they appear on the panel. The mixer is loaded with 12 patterns of Touch Effects: RIPPLE, LENS, SPOT, RADIATION, CUBE, BLOCK, KALEIDO, TWIST, ZOOM, DROP, BLUR and DISTORTION. Text Effects: Automatically detects the tempo of the track and displays text messages in sync with the beat. The SVM-1000 is equipped with 6 patterns of Text Effects: RANDOM, ZOOM, BLOCK, ROTATION, CRUSH and SLIDE. Messages are inputted via the touch screenÃ¢â‚¬â„¢s built-in keyboard, but it is also possible to use an external USB keyboard. This feature lets you call upon JPEG images (up to 8 files) from SD cards or USB memory for use in the mixerÃ¢â‚¬â„¢s Still Image Sampler. By using effects on still images, or mixing these with motion pictures or other stills, this function further expands the range of a creative performance when compared with a moving image-only show. It also allows looping of JPEGs, such as logos of the event/venue/sponsors and DJ branding, to play automatically like a slide show. Video Trim: Allows you to adjust the brightness of input video in each channel. Video EQ: Allows you to assign video parameters, like RGB, CONTRAST, HUE and SATURATION to EQ, and to synchronise sound equalisers and video control. AV Sync: Allows you to switch between sound and video with synchronous and separate control. Fader Start: Connect up PioneerÃ¢â‚¬â„¢s DVJ players (DVJ-X1s/DVJ-1000s) with a control cable and sliding the cross fader or channel faders can start playback. Fully Assignable MIDI Function: Allows you to control external MIDI equipment, such as EFX and DJ/VJ application software. Video Monitor Select: Allows you to select the type of video monitor output: MASTER, CHANNEL, MASTER AND CHANNEL or MIRROR OF MASTER. I’d love to get all excited and breathless about this, but as we all know, the devil is in the details. I’d definitely be waiting for some hands-on reviews before preordering this thing. It seems to me that manufacturers are still wasting quite a lot of resources on features designed to impress club owners and the visually inexperienced, but nigh on useless for serious visualists (SD Card Slideshow mixed with text effects anyone?). Hype aside, it’s extremely exciting to have another manufacturer entering the VJ hardware market. This can only be beneficial in the long run, but I think it’s going to be a while before we have the range of products and prices currently available to DJs.